We first got to know Rex's during SpiceaWAR, and oh did we get to know them. The wings were the spiciest ones I have ever ingested and thus I did not try the wings during our visit to the establishment. Obviously the ones served in the restaurant won't be as hot as what we ate in the contest, but I need some recovery time. Anyone who likes spicy wings should probably try them here, though, as Rex's has mastered the art of hot wings. Instead we decided to focus on the "burgers" and "brews", the apparent new craze-combination here in Spokane. The "brews" were a bit of a letdown, as there are only a handful of taps here -- significantly more bottles -- and some take up space with crap like PBR. Thus I'm not sure if this is really a brews spot as such. It is, however, a burger spot and a very good one at that. I usually don't get that excited about hamburgers, but Rex's does them really quite well. You customize your meal using checkboxes on a piece of paper: Meat, chease, toppings, fries... It's all here for the taking, and you can make your plate as big or small as you want. 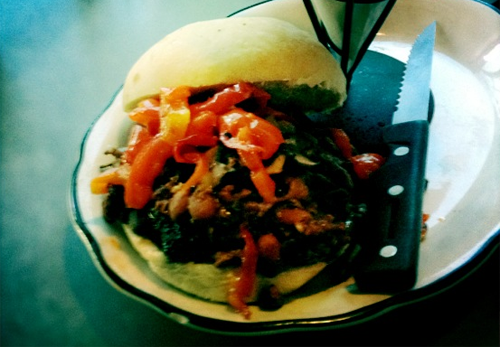 I am but a simple soul, so I went with a buffalo burger topped with buffalo chili, mushrooms, and peppers. Regular fries on the side, though the sweet potato ones sounded tempting. Now, most spots around town overcook burgers, but here mine came out with a nice pink hue in the center. The chili actually complimented the hamburger -- a nice change, as chili often can be overpowering -- and the peppers were sweet with a subtle spice to them. A burger might always just be a burger, but this, in my opinion, was a really good burger. The fries, too, were a hit. Nicely fried, nicely seasoned, nicely served, and with a (wait for it) nice selection of sauces on the side. The rest of the menu consists of a selection of sandwiches and appetizers. There's even a veggie plate, which is great for those who want something light and fresh. We can respect Rex's. Most places with "burgers" in the title tend to be as exciting as falling asleep, and while Rex's don't go out of its way to be incredibly original, they kick things up by delivering good, honest food. We'll add Rex's to our rotation, and I have wings in my sight next time. Now, hopefully they'll do something about that "brews" part. Do you recommend Rex's Burgers & Brews? Make your voice heard!